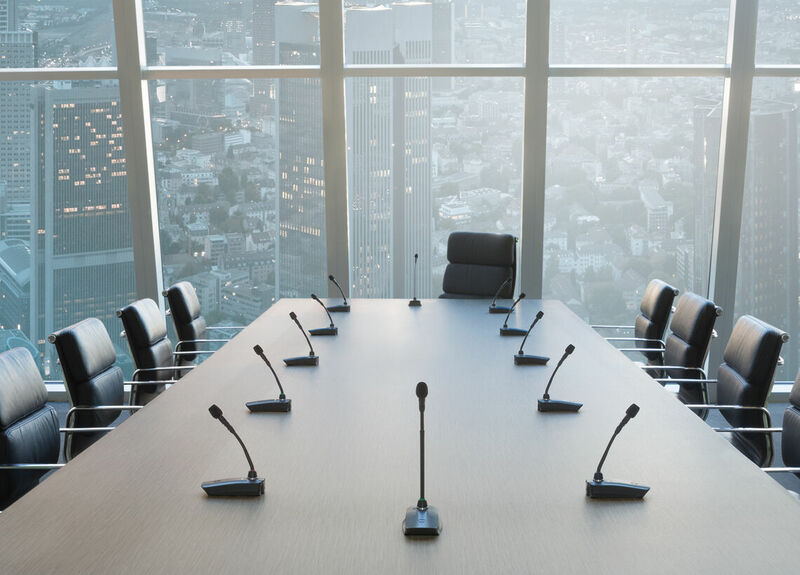 Ceiling array microphone technology can help to overcome a number of sound quality issues in a variety of conference and presentation spaces. 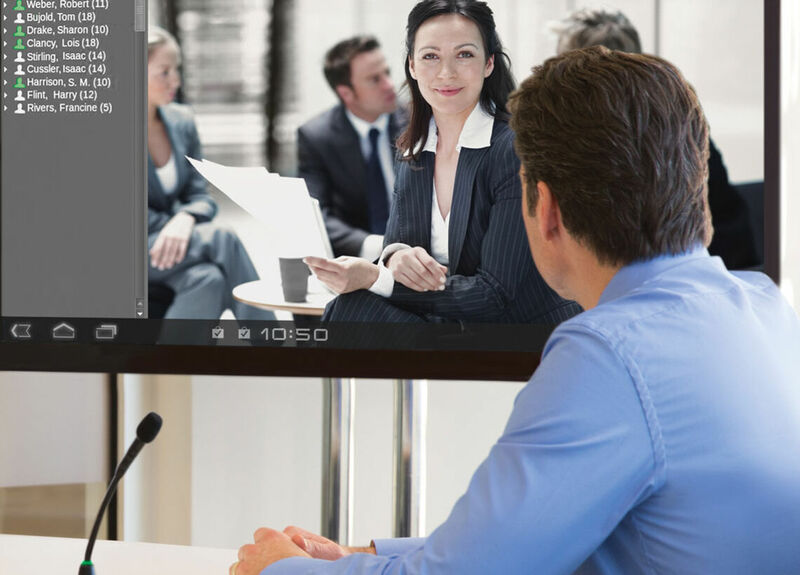 Besides ensuring people in the meeting room are able to converse naturally without having to interact directly with a microphone, it crucially allows participants to hear everyone in that room when they speak – no matter where they happen to be sitting. 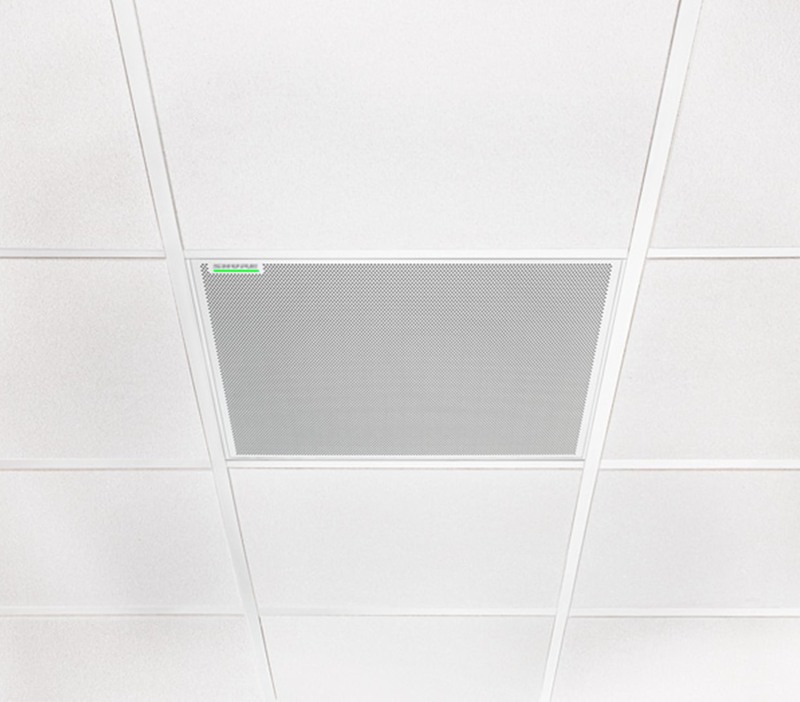 Ceiling arrays like the MXA910 are also quite effective in situations when talkers move around the room, using items such as whiteboards. A so-called voice lift system is intended to restore the natural speech level from a talker, so those sat some distance from the talker can hear what is being said. The high degree of directionality from the MXA910 allows greater voice lift levels from farther away than other microphones before traditional feedback issues start to occur. 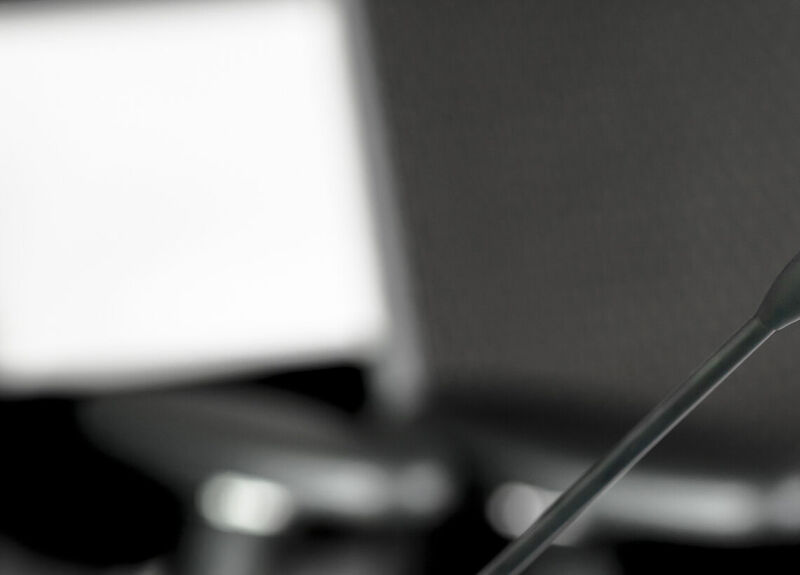 To get the most from these benefits, however, it is crucial that the technology is properly configured for the room, and there are a number of considerations that should be taken into account when designing and installing a ceiling microphone array system. Below are some key best practices to ensure users enjoy the full benefits of a properly configured ceiling array. First, to get the most out of this kind of product, you really need to spend time and effort in the commissioning stage. Ensure time is taken to understand the space and what it will be used for to design the most suitable setup. 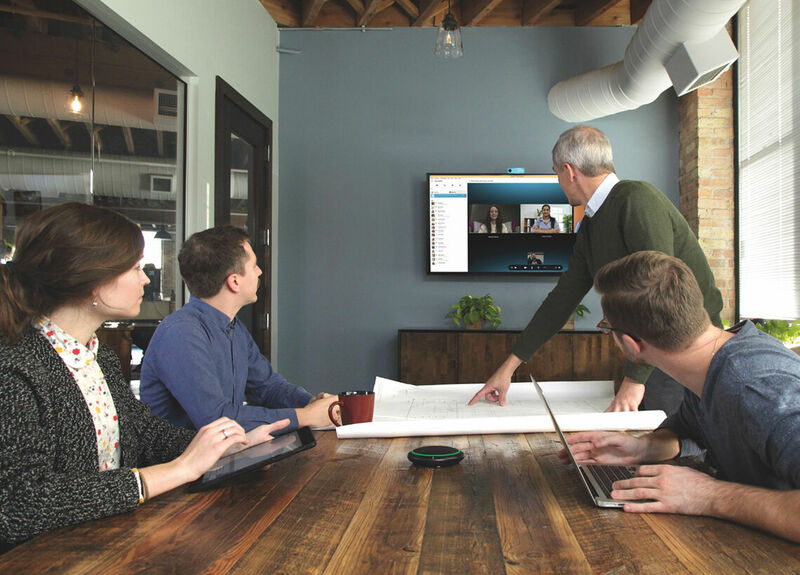 No matter the size or complexity of the installation, the Shure Designer System Configuration software can save huge amounts of time, enabling you to create configurations without even being connected to a MXA910. Then simply import the coverage settings to the hardware onsite. 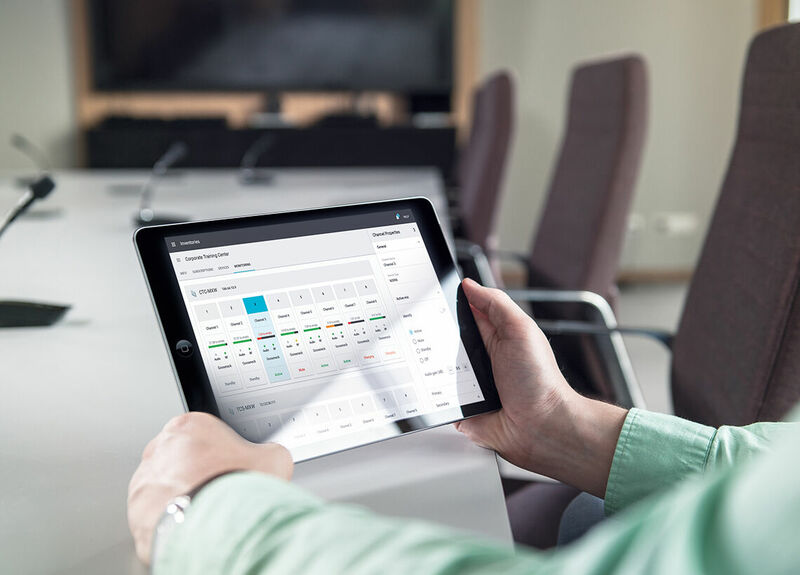 This desktop application for integrators and system designers makes it easier to visualize and implement installations. 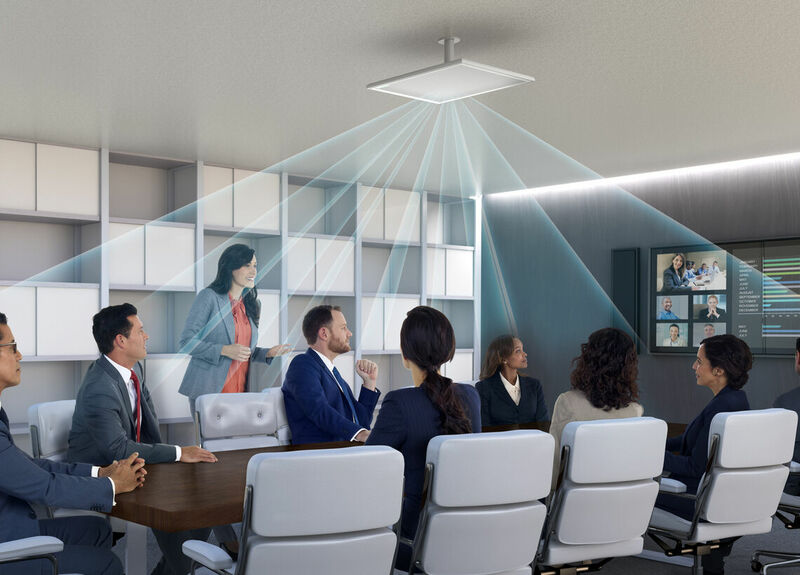 This capability lets you more accurately predict the number of microphones necessary to cover a given meeting space and better arrange lobes to ensure maximum coverage for enhanced clarity and intelligibility. While there are some suggested starting settings for ceiling arrays in the MXA910 user guide, it is still important to listen to the sound in the room and adjust the microphone as needed. Similarly, while the MXA910 offers pre-loaded templates for positioning lobes, do not rely fully on these. While a good starting point, lobes will need to be adjusted to match the talker’s position. All spaces are different, so adapting the system might be necessary. While lobes need to be aimed at the areas where talkers are located, each unit can pick up many talkers so there is no need to have one per person. Use an appropriate number of lobes to cover the desired area with minimum overlap in coverage, using Medium and Wide lobes if necessary. Don’t be afraid to widen the pickup area – a narrow setting can mean talkers drift out of the hotspot; widening will not negatively affect the sound quality. Use headphones to verify aiming by listening to talkers inside and outside of lobes. A Dante-enabled headphone amplifier, like the one built into Shure’s MXWANI devices, or a Dante Virtual Soundcard are invaluable during system commissioning. It is vital to ensure the microphone’s lobes are positioned properly prior adjusting other parts of the system. Most automixers allow you to limit the number of open microphones, or NOM for short. In some applications, reducing NOM to just one or two mics reproduces more intelligible sound. In my experience, a starting point should be a maximum of two. Generally speaking, if you’re listening to a conversation, two people having an exchange can easily be understood. When a third person joins in, it can be difficult to follow what’s going on. And if a fourth person starts speaking, things become too chaotic. In pretty much any situation, if three people are talking simultaneously, at least one will quiet down so having more than two open mics in any given situation is just adding more noise than is necessary. However, if these settings are not producing good results, then raising the maximum NOM will allow more lobes to be active at any one time. The default setting within MXA910’s Intellimix is 8. 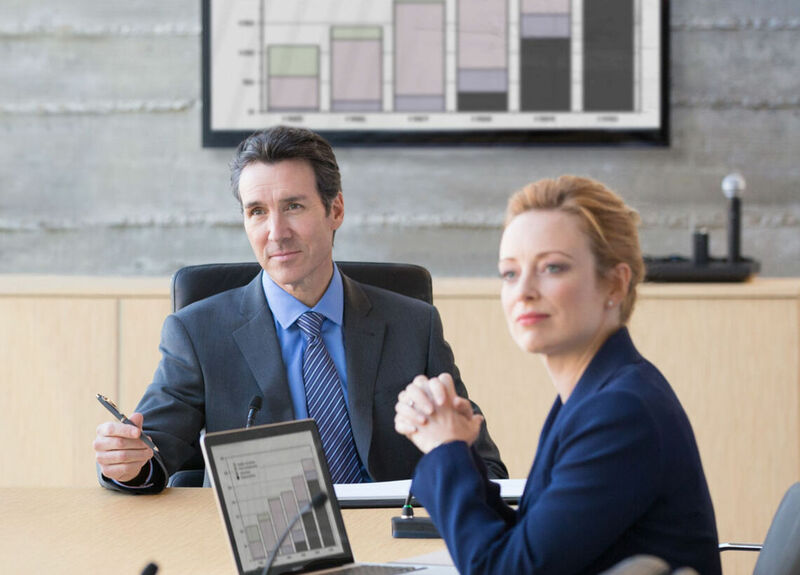 Ambient noise can significantly degrade speech intelligibility in a room, so use equalization to reduce low frequency noise. The more active lobes at once results in a buildup of low frequency response. To combat this use a low shelf filter deployed per channel either in the MXA910’s interface, or in an external DSP. The important thing is to make sure that the number of microphones you’ve got open is reflected in how much low end you’re cutting out. The more open lobes in use, the wider the pickup area and the greater overlap in lobes, the higher the cumulative low-end response is and therefore the more bottom end you need to EQ out. While it may sound surprising, setting a low shelf EQ filter at 960Hz, with -10 dB of cut per lobe is recommended as a starting point. But be sure to listen to the output to find the balance between cutting out low-end muffle and losing the body of the voice. When using an MXA910 with the Shure Intellimix P300 leave EQ in the microphone flat and use the ‘910 Optimization Mode’ in the P300. When setting up a ceiling array microphone it is recommended to use an external digital signal processing (DSP) unit, such as the Shure IntelliMix P300, to apply acoustic echo cancellation (AEC) and noise reduction on each MXA910 output channel. Although the array features the IntelliMix algorithm to mix, an AEC algorithm lets you listen to a consistent model of the environment. Every time the gated mixer changes which lobe to use, the acoustic environment is essentially changing and the far end talkers can hear echo while the AEC algorithm remodels and learns how the room now sounds with the new lobe. By having an AEC processing per lobe, each area of the room will be consistently monitored for sound quality. It’s also recommended to have the AEC processing happen before any other alterations such as EQ or compression are applied. When lobes are properly aimed, the MXA910 provides even coverage throughout the entire desired pickup area. The use of automatic gain control (AGC) or speech leveling is generally not necessary, but, if required, the IntelliMix P300 has AGC for each channel. Since you have gain control over each lobe within the array for situations where one person is sitting further away from the mic compared to another, there’s a temptation to increase gain in that lobe. However, you can end up falsely activating the area in the gated mixer, because it’s now more sensitive compared to the lobes without additional gain. The way to compensate for this is to add more gain into the system after the gated auto mixer has turned on for that channel. Most codecs or applications such as Skype and Hangouts have a threshold at which low volume levels are considered noise, so it’s important to make sure you’re sending a healthy proportional level between the desired signal and unwanted sounds. Adjust the transmit level to the lowest possible value while listening from the far end before noise or distortion is introduced. The process for doing this is to note your starting automixer output level: Have someone talk at the near end while you listen at the far end turning up the automixer output in the near end slowly until the level of the speech of the talker stops getting louder. Back down the output of the automixer to the setting where an increase in speech level was last noticed and take note of this new output level. Go back and forth between your starting level and your new level. Overall, you may find that the new automixer output level is 10 to 15dB below your starting point and that ambient noise and other undesirable sounds have been attenuated significantly, while speech level remains the same. 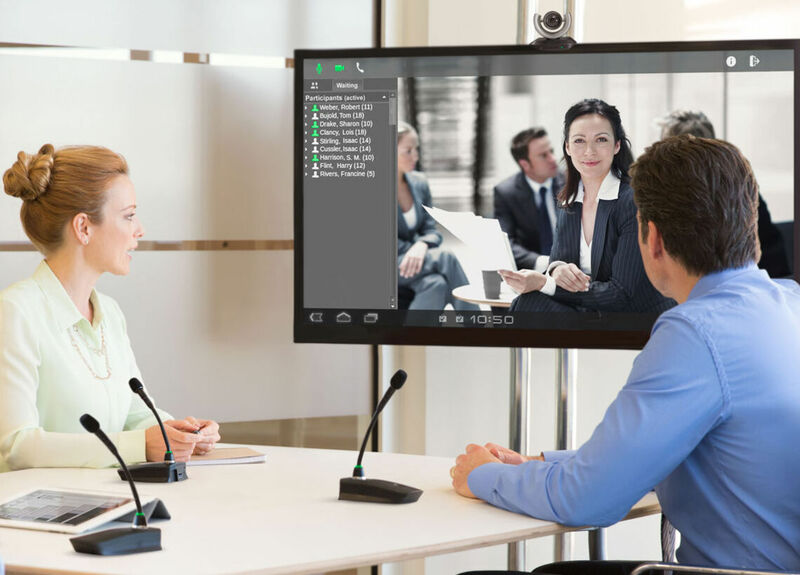 The MXA910 can also be used in AV conferencing systems that require voice lift, although settings for this will be different than for regular conferencing. Be aware that not all rooms will accommodate voice lift, particularly small ones. In order to determine whether a room is suitable for a voice lift system some calculations should be made. Shure has a potential acoustic gain/needed acoustic gain (PAG/NAG) calculator to determine if a system can produce enough gain to provide an optimal listening experience before causing feedback. The calculator, which is ‘standard’ referenced to omnidirectional mics, will help you work out the number of microphones and the distances between various elements of the system. 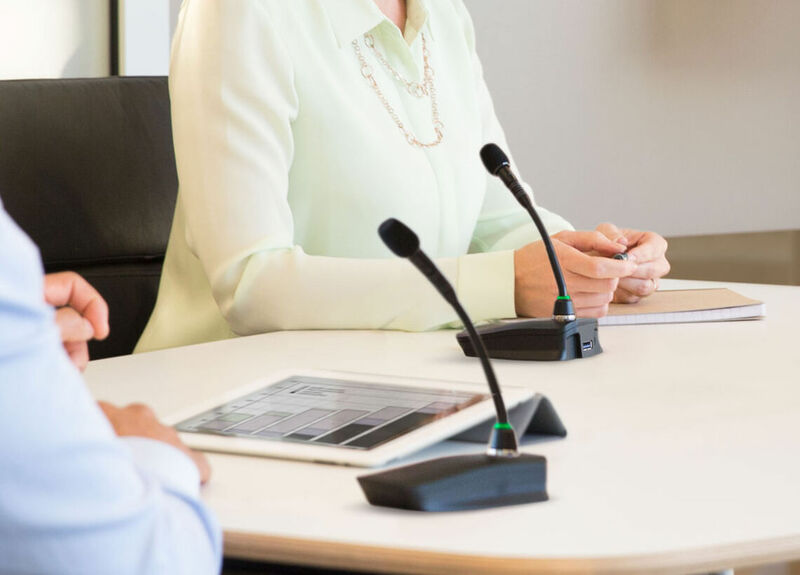 When compared to an omnidirectional or cardioid microphone, the MXA910 can provide from 7 to 11 dBs additional level of voice lift before feedback starts to occur in a typical conference room – making it an excellent microphone choice for a voice lift application. Finally, when it comes to using MXA910 for voice lift, speaker zoning is the key to success. In order to achieve sufficient voice lift level in a room there must be at least two loudspeaker zones. These typically refer to loudspeakers located in an area of a room that are driven by a dedicated amplifier channel. This will allow microphones located on one side of the room to drive only the loudspeaker zone located on the opposite side. When implementing voice lift you’re probably only reinforcing a very small amount of frequencies, the transient sounds found mostly in consonants – somewhere between 1.5k and 6K. You don’t want to reinforce all the low end and low mids, because the room will become boomy and you get a higher risk of feedback. So although you’re picking up full range into the mic, you’re only reinforcing a very small amount of what’s been picked up. But if you sent that same signal to the far-end listeners, they would experience poor quality, tinny sound. Therefore you need to process the signals for voice lift separately from what’s being used for conferencing. Now, that might sound like a lot to keep in mind. 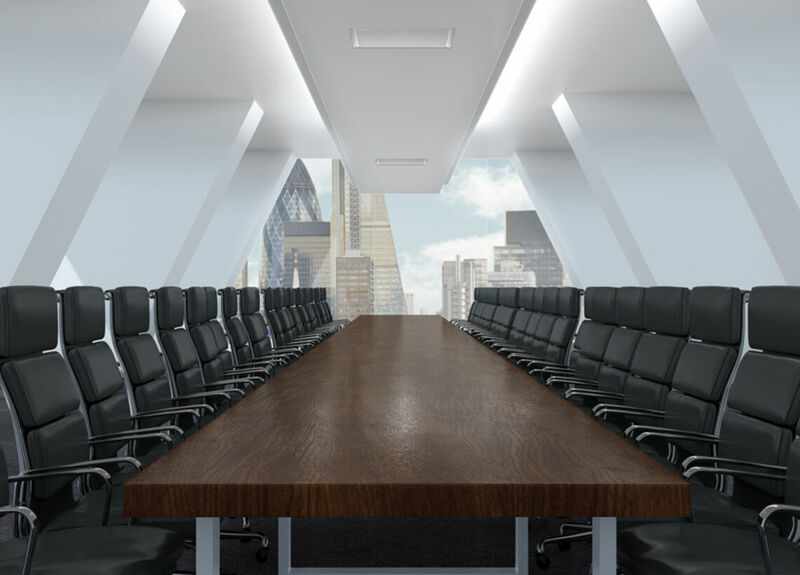 But if you stick to these key tips and prep your system properly before putting it into service, ceiling array technology can greatly improve the conference and presentation experience at your organization. 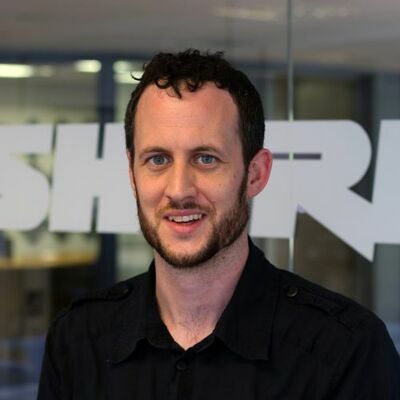 Andrew Francis is a Senior Applications Engineer for the Shure UK Systems Group who has a decade of AV experience covering both installed systems and live events. During this time he has worked with politicians and business leaders, as well as other high-profile public figures such as His Holiness The Pope, while producing conferences, awards events and gala dinners. On the installation side he spent three years as a technical manager designing and commissioning AV systems for large corporate installations, specialising in multipurpose flexible meeting rooms.